Nintendo released its first mobile game last week, and with unprecedented levels of support from Apple, Super Mario Run was poised to become the most successful mobile game the App store has seen so far. However, eager players were less than thrilled once the game hit, sending Nintendo’s stock down 14% in the first few days. 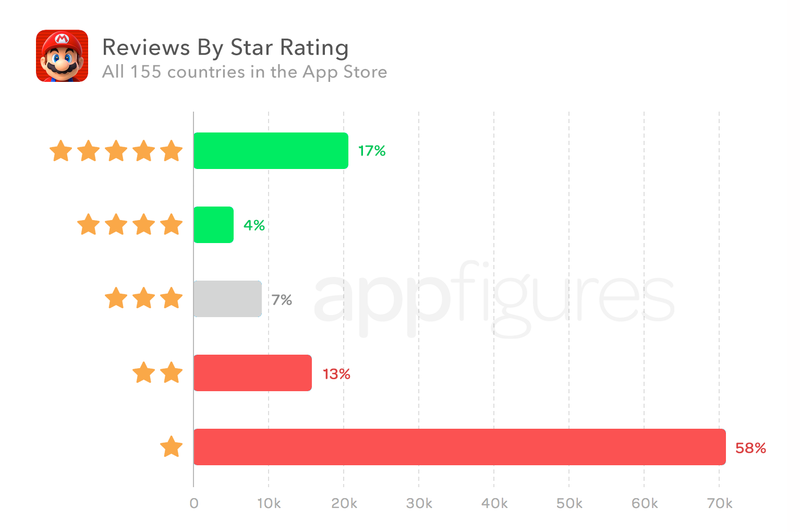 We’ve been covering the release from day one and have noticed its not-too-stellar performance, so we analyzed all of the game’s 120,000 App Store reviews to get a better understanding of what went wrong. To start our analysis, let’s take a look at how the game is rated so far. We collected all 120,000+ reviews available (as of 12/21), and grouped them by star rating. Boy are people unhappy. Overall, 71% of all players gave the game a 1 or 2-star review. That’s harsh. As of right now, Super Mario Run’s average rating is just 2.1 stars. That’s really low for such a well crafted game. Is this unhappiness widespread, or isolated geographically? 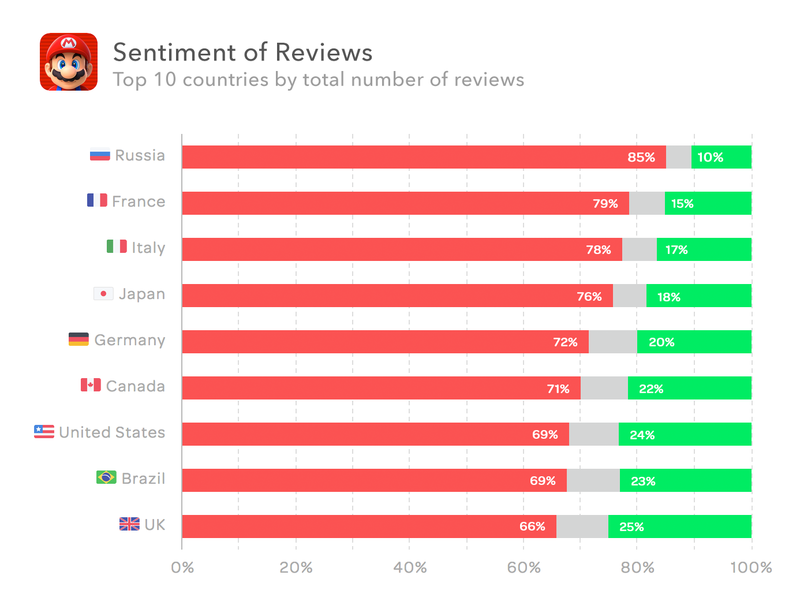 To answer this question we looked at all reviews by country and analyzed the top 10 countries with most reviews. In the chart below you’ll see the ratio of negative (1 and 2-star reviews in red) to positive (4 and 5-star reviews in green) and neutral reviews (3-star reviews in gray). If you thought 71% was high, check out Russia. 85% of reviews from Russia are negative compared to just 10% positive. France, Italy, Japan, and Germany have an above average negative rating as well. The bottom of the top 10 list comes in below average, but not by much, suggesting this isn’t isolated but rather a problem that spans different cultures and languages. So, what’s upsetting so many players around the world? A text analysis of all reviews in English shows the most common topics mentioned include different variations of “price is too high” and “not enough free levels”. The most common words those reviews included were: pay, free, money, price, and purchase. What we found interesting is that many of the negative reviews were emotionally charged, using words such as sad and disappointed. This just goes to show the expectation Nintendo set when announcing the game in September. So players don’t want to pay $9.99 for the game. That’s certainly a higher price point than most other games, however we don’t think that’s the only issue. Super Mario Run is free-to-download (demo), and not a free-to-play (freemium), which is a much more common monetization strategy in the App Store. Demos, unlike freemium titles, limit how much you get access to very strictly, enticing you with a bit and putting up a paywall for the rest. Freemium titles on the other hand, give you access to most of the game for free but offer you upgrades along the way. Successful free-to-play game, like Candy Crush, use consumable in-app purchases so that players need to buy more to continue. They don’t have to, but they can, and that’s a very important difference. If you’d ask 10 different people whether they like free-to-play titles, 8 would probably say no but would still play those games and won’t leave them extremely negative reviews. That’s why 4 of the 5 Top Grossing apps in the U.S.right now are freemium games. SEGA’s Sonic Dash, arguably similar in terms of brand recognition and casual nature, has an average rating of 4.5 stars with nearly 3 times the number of reviews. Sure, it’s been around since 2013 and has a head start, but with more than 75% of reviews being positive it’s hard to argue. 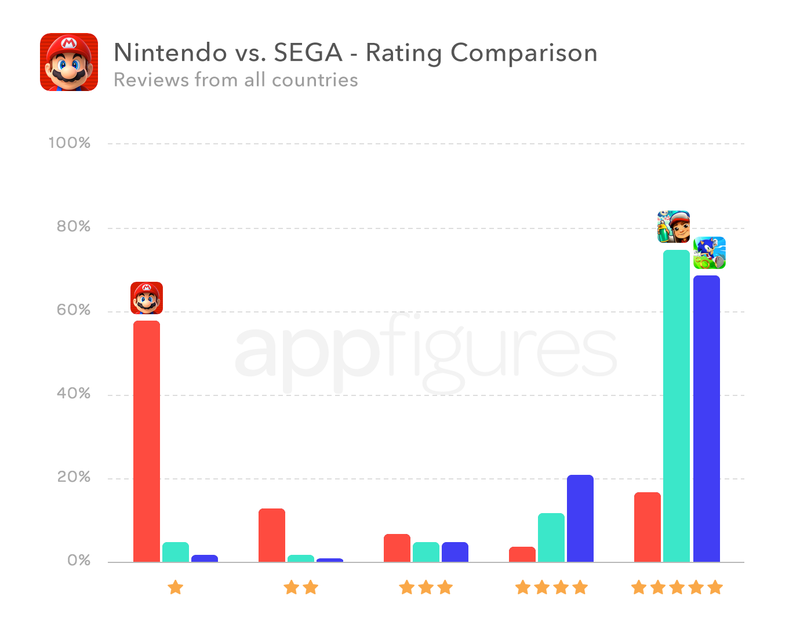 To make the comparison even more objective we added Subway Surfers, another comparable game with a similar number of reviews. This title also has an average rating of 4.5 stars. Why did Nintendo choose the more traditional demo approach and not freemium is hard to tell. Keeping things simple is what the company said publicly, but it’s also possible they relied on the brand a bit too much. In a different world, where Super Mario Run launched as a free game with consumable in-app purchases, things might have been significantly different. Hindsight is always 20/20. This report paints a pretty unpleasant picture for Super Mario Run, and while that’s true right now, it’s possible (and likely) that between new users, strategic changes, and updates to the game, in time, Super Mario Run will gain momentum and retain players for longer periods of time. Enough to get them to tap that buy button. We’ll be keeping an eye on that and report if we see it change, so keep an eye on the blog, follow us on Twitter, or subscribe to our mailing list. Track every review for all of your apps with appFigures. Start your free trial. I wonder what the correlation is between those reviews and buzz/word of mouth. Pricing issues aside, I think the game itself is fantastic… super playable, well made, obviously a strong brand, etc. Are there are comparable apps: super high-quality but skewered over their cost? This article fails to explain if Mario made more than Sonic/Subway Rush? Did they actually get it “right”? Sonic’s launch was mediocre with reviewers complaining it was trying to extract money (https://en.wikipedia.org/wiki/Sonic_Dash). It recovered later. Also note Sonic Dash 2: Sonic Boom is nowhere in the charts today – with 5 star reviews. Unhappy reviews over the price doesn’t mean it didn’t sell. However Nintendo’s strategy of an unsophisticated single hit of content for one price has already shown to be the least effective. Almost all the top grossing apps work on extracting thousands out of a small few. Nintendo are currently touting the old model of one price fits all, but I suspect they may change their tune in the future. I often hear people say that pricing models like these are from the past and won’t work. The only real argument I usually hear is: you can make more money with in-app purchase consumables. Even at the cost of getting people addicted and spend tons of money on the game. (I don’t think “getting people addicted” can be part of a morally sound approach.) Can you point out additional info? Just take a look at the top grossing apps in the Apple Appstore.